Export of Goods through Courier or Foreign Post Office. Here we discuss about the enclosures for proof of landing required to be submitted to apply for MEIS, Merchandise Exports from India Scheme. 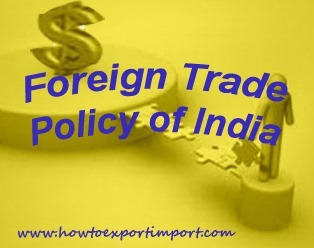 What Proof of landing of export consignment in notified Market to be enclosed to claim MEIS, Merchandise Exports from India Scheme under Foreign Trade Policy 2015-2020 (FTP 2015-20). (v) For Land locked notified Market, Rail/Lorry receipts of transportation of goods from Port to Land locked notified Market. (vi) Any other document that may satisfactorily prove to RA concerned that goods have landed in / reached the notified Market. In case of (iv) and (vi) above, the accredited agent of the Goods Carrier must certify that he is the accredited agent of the concerned Goods Carrier on the date of issuance of the tracking report / document. Further, in the case of issuance of any other document under (vi) above, the accredited agent must state that proof of landing of goods in relevant notified Market is given based on information available in the Goods Carrier’s backup database and he has verified the same and issued this document accordingly. In cases of exports using e commerce, exporter may submit express operator landing certificate/online web tracking print out indicating airway bill number as prescribed in enclosure (B) to ANF 3D. This post explains about the enclosures for proof of landing required to be submitted to apply for MEIS, Merchandise Exports from India Scheme. If you would like to write more about the procedures and formalities to apply for MEIS, share below your thoughts. Comment below about enclosures for proof of landing required to be submitted to apply for MEIS. Sandeep G.: On 04 April 2015 Dear Sir, My query regarding proof landing certificate to be submitted for newly announced scheme MEIS as per para 3.03 of HBP 2015-20 According to para 3.03(a) of HBP 2015-20 : Wherever the reward under MEIS is available to all countries, proof of landing shall not be required to be submitted for claiming the reward in other hand para 3.03(b)says Uploading/submission of documents, as a proof of landing:As a measure of ease of doing business, documents as a proof of landing of export consignment in notified market can be digitally uploaded Now i would like to know that whether proof of landing required to be submitted or not for claiming the benefits under MEIS, since para 3.03(a)says the countries listed under MEIS i.e. A,B & C proof of landing not required & 3.03(b) says to be submitted for notified market. Kindly advice. Thanks & Regards Sandeep G.
mohan patodia: On 07 April 2015 we .export by courier fedex ups.we get a airway bill only and goods r delvd at destnt can anybody clarify what document should we give as lending certfct. javed maner: On 21 May 2015 what is porceeder for MEIS - document submitted to DGFT office. Ganesh: On 12 September 2015 We are trying to apply MEIS scheme online, but while we enter the Shipping bill and IEC code we could not find the eBRC. Getting alarm that no files found. Can any one explain why it is so. We have already made few exports how to claim the same manually. NAGESH : On 06 April 2016 DIGITAL SIGNED LANDING CERTIFICATE IS ACCEPTABLE OR NOT ACCEPTABLE FOR MEIS. PLEASE CONFIRM. B D Prasad: On 05 December 2016 We received order from country A to install three nos of an item in India. Full Payment received. we placed order to country B to import that items four nos and 10% advance paid based on CIF delhi. Now client from Country A asked us to send one peace to them. material is ready for despatch from country B. what are the formalities required to send one piece to country A directly from country B and balance three to India. Rakesh Vala: On 13 December 2017 Hi.... I would like to apply for MEIS scheme for shipments made through Air. i want to know the Procedure and documents required. Rakesh Vala: On 13 December 2017 We have exported goods directly from country A to Country B then what Proof/letter should i submit to Bank for payment.